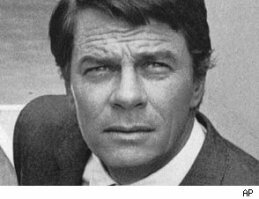 Veteran actor Peter Graves, renowned for his distinctive voice, passed away yesterday at age 83. He shot to fame as IMF leader James Phelps on the hit TV show Mission: Impossible (a role for which he won a Golden Globe), acted opposite Robert Mitchum in Night of the Hunter, provided the voice for the Emmy-winning A&E Biography series, and was known to an entire generation for his work as Captain Clarence Oveur from the classic spoof Airplane! It’s hard to say there’s a good way to die, but if there is, Peter Graves was lucky enough to get it. He went out for a morning brunch with his family, then passed away upon returning home. The official cause is a heart attack. One of his daughters provided CPR, but it was in vain. Graves passes a few days shy of his 84th birthday.